Michael Prettyman is the Director of Therapeutic Exercise here at Pain Free New Mexico. Michael is a personal trainer with certification from the American Council on Exercise, and an affiliate of American Red Cross where he received his CPR/AED training. He owns and operates his own personal training business in his free time, where he takes on clients and helps them reach their personal fitness goals. Michael has firsthand knowledge of how important exercise and nutrition is to making positive changes in personal well-being, and improving health outcomes for individuals at risk. 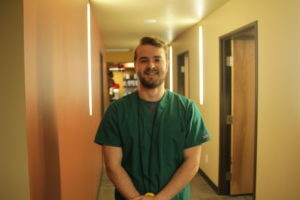 He is responsible for not only creating and maintaining a suitable workout environment for his patients, but also acts as their primary motivator. Developing exercise protocols that allow patients to perform activities of daily living in a pain free manner is his main priority.